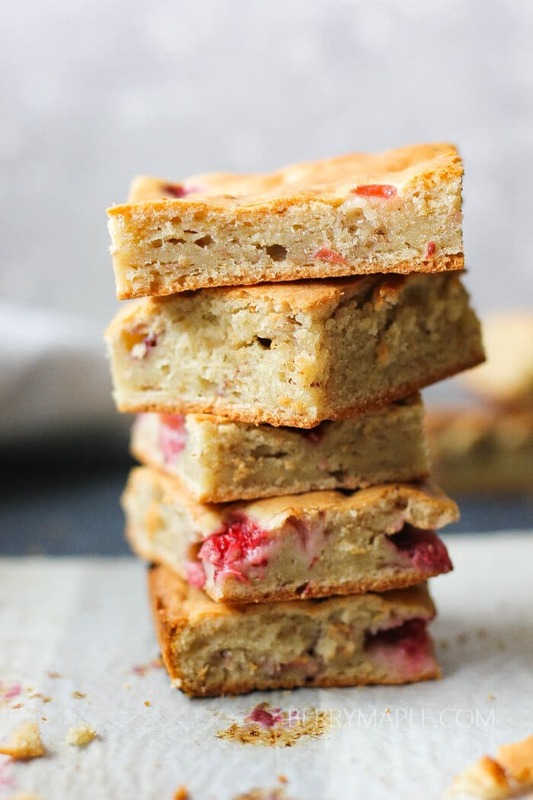 Moist velvety texture and strawberry brown sugar flavor-everything is in this cream cheese strawberry bars! 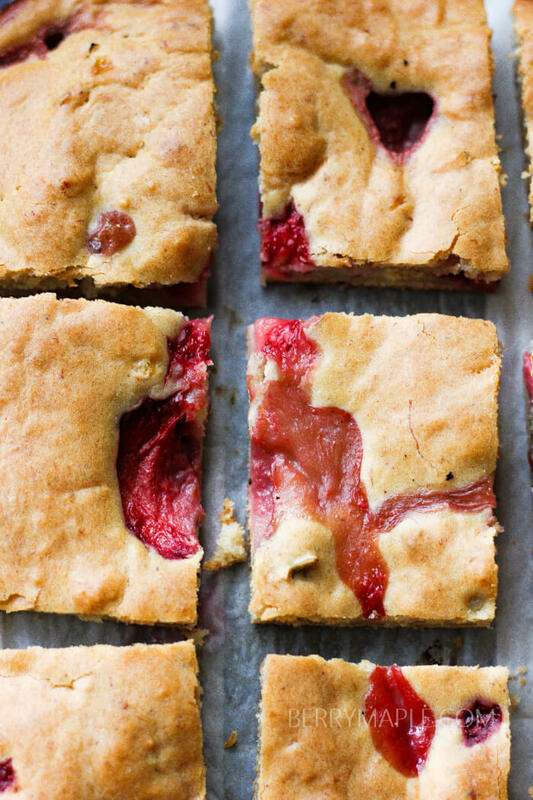 Crunchy on the outside and chewy moist on the inside- we love to have this strawberry cream cheese bars for breakfast! Also a great add-on to your kids lunch box! If you prefer you can cook them in a round pan, frost with your favorite cream and you will get a delicious cream cheese cake! We did a lot of strawberry picking on local farms in the summer. My kids were excited to run between the little bushes of juicy ripe strawberries and picking them( honestly, mostly eating). We ended up picking so much, i had to freeze more than 7 gallons. Oh, how nice is it to have frozen local strawberries in the freezer! Can be used in so many different recipes during the year. Banana helps to balance the sweetness of the bars, but don’t be afraid to put some brown sugar here, that’s the key for a caramel -like taste! Plan to cook this bars for your Sunday family breakfast and leave some for snacking during the week (keep them in a zip lock bag in the fridge). 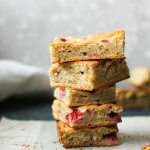 Moist velvety texture and strawberry brown sugar flavor-everything in this cream cheese strawberry bars! Heat the oven to 350 degrees. Line the baking dish (13in/9in) with parchment paper or spay with oil spray. Mash banana in a big bowl, add sugar, eggs, butter, cream cheese and milk. Mix very well. Add flour, baking soda and baking powder. Mix well, then stir in strawberries. Pour the dough into the baking dish and bake for 40 minutes. Get the baking dish out of the oven. Let it cool. Cut the cake into square bars and enjoy with a cup of tea or coffee!